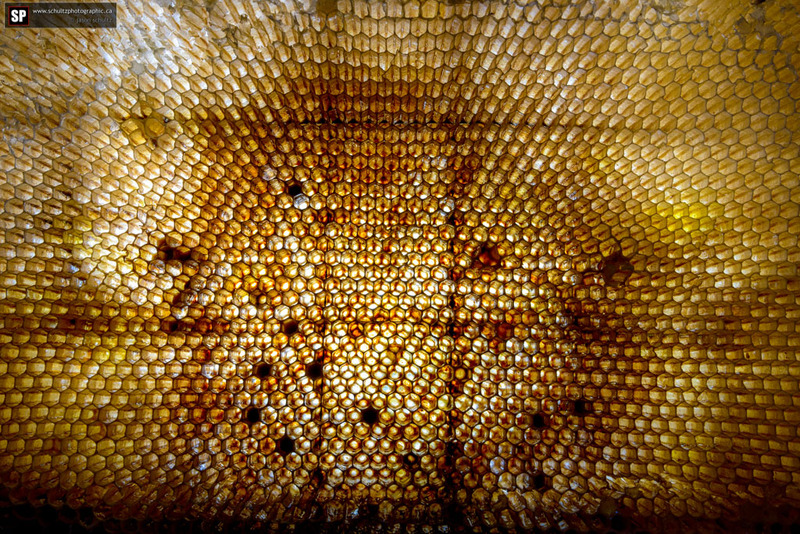 The second instalment in my Organics photo project is here! It’s been over a year since my last post about the Daybreak Mill in this on going project looking at various aspects of Organic farming. This time around, we are looking at harvesting honey. In recent history, bees have been dying at an alarming rate. Some debate about why this is happening has gone on. The long and short of it is covered in this TED Talk by Marla Spivak. 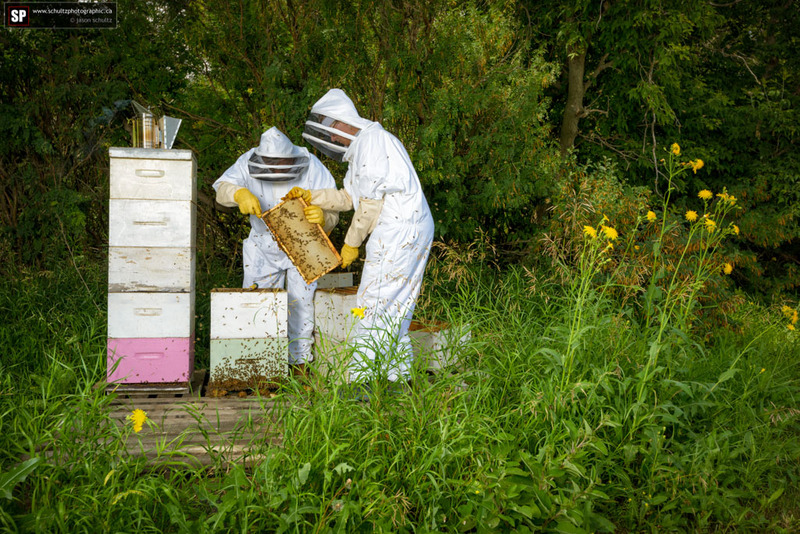 At the same time, more and more interest has been shown by homesteaders, farmers and even city folk with backyards about keeping bees and harvesting the honey. It is a developing trend. 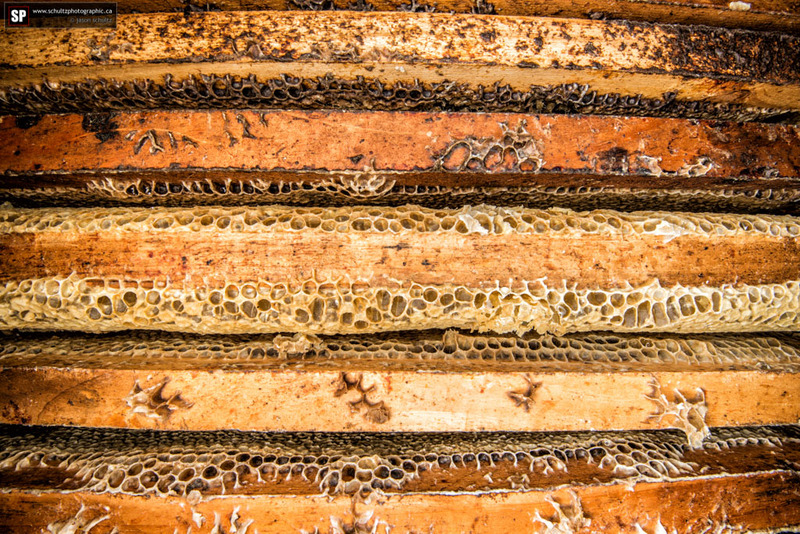 And few trends can be more delicious than fresh off the comb, unprocessed honey! The first stage in the bee game is getting your hives setup and going. Once they are established with a good queen it doesn’t take these industrious little buzzers long before they have filled the frames in the super. On August 8th of this year, I was able to go and see the process first hand out at Glenys and Mark Neuman’s farm. They have begun keeping bees and have a small “beginning” setup like what most enthusiasts would have. It is truly an amazing process! They let the first two layers of supers fill up as a food pantry for the hive. Any supers on top of that are up for grabs to harvest. After smoking the hive and gently brushing away any bees that might still be in the super box, the full honey frames are then brought in for harvest. It’s a straightforward process of de-capping the combs with a special tool that looks like a hair pick. You gently pick your way across the frame and remove the end cap that the bees put over the comb, making it easy for the honey to spin out in the extractor. 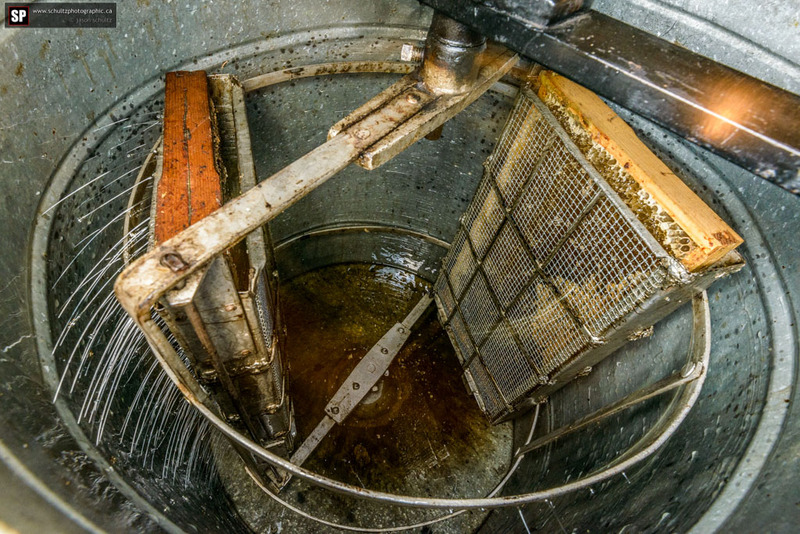 From there, the separated honey simply pools at the bottom and drains out through a tap where it is filtered and made ready for jars. The empty frames are then ready to go back into the supers where the bees will quickly refill them. 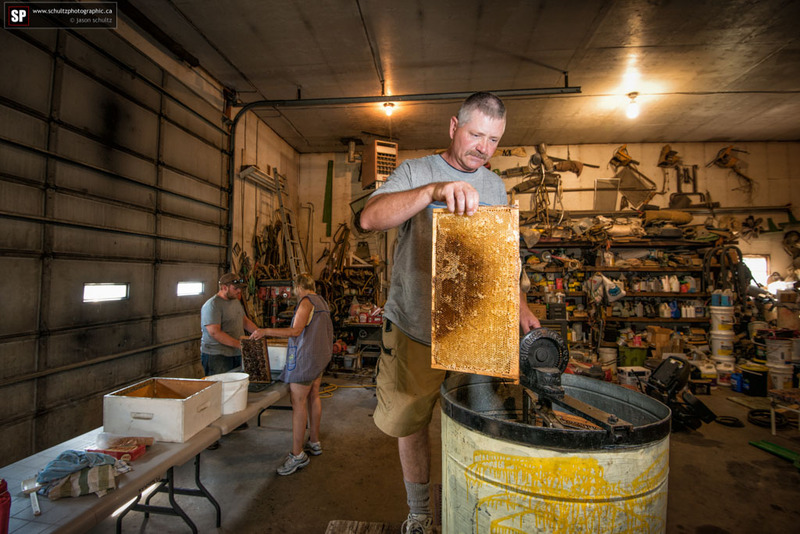 This honey harvest, where two supers were cleaned out, produced 10 gallons of honey (5 per super). And it only takes 7-10 days for the bees to fill them up again! 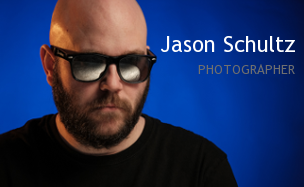 This entry was posted on September 28, 2014 by schultzphotographic. 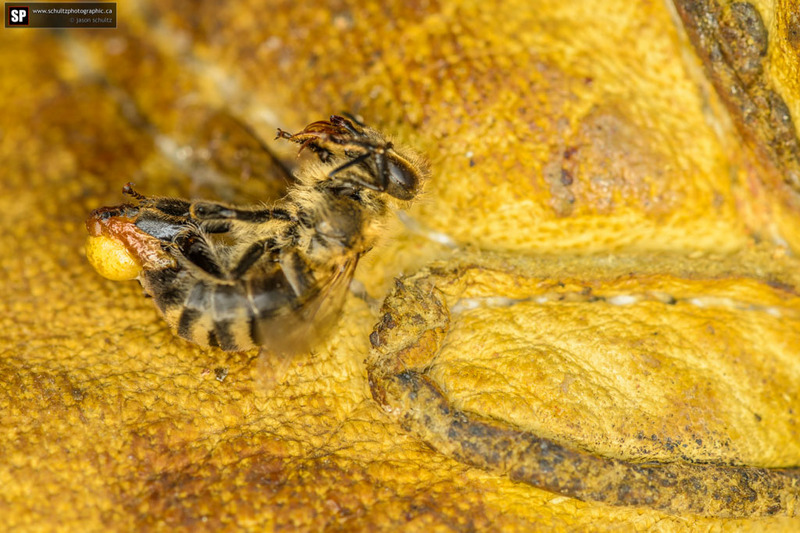 It was filed under Organic and was tagged with Alameda, Bee Keeping, Bees, Bees in Trouble, Farm, Honey, Mark and Glenys, Neuman, Organic, Organics, Personal Photography Project, Saskatchewan.